The bugging of the White House, electronic experts agree, was a wireman's dream job. The Secret Service's Technical Security Division had at its disposal as much money as it needed, ample time to complete the task-and no need to hide the job from the man of the house. And in the Oval Office, at least, the buggers had a setting tailor-made for electronic eavesdropping. "With the rich carpeting and wall draperies," noted one countersurveillance professional last week, "the Oval Office is an ideal room for recording conversations. It's probably as good as many a sound studio." With the Secret Service silenced by Presidential order, exact details of the bugging were scarce. However, in testimony before the Ervin committee, former White House aide Alexander P. Butterfield said that four Presidential telephones had been linked to tape recorders. These bugs were in the Oval Office, the Executive Office Building, the Lincoln Sitting Room where President Nixon habitually works in the evenings, and the Aspen Cabin at Camp David. The tape recorders, most of them in the West Wing basement of the White House, were primed to start when the telephones were picked up. The setup for recording normal conversations in the Oval Office and the Executive Office Building was more complex, keyed to a locator system designed to keep track of Presidential movements. The system, controlled by the Secret Service command post in the White House basement beneath the Cabinet Room, is linked to several gray "locator boxes" in key aides' offices to indicate the President's whereabouts at any time. 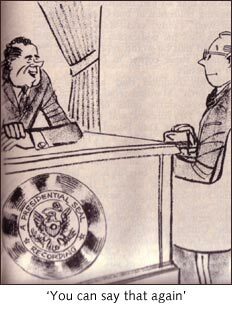 The microphone systems in the Oval Office or the Executive Office Building hideaway were automatically activated by the locator system; intriguingly, Mr. Nixon had no optional switch that could turn the bugs off. Because there was no need to hide bugs from Mr. Nixon's own security technicians, the Secret Service probably chose the most obvious locations for their microphones. According to debugging expert David Morris of Holmes Protection Agency, the microphones would be comparatively large and placed where they could obtain the most balanced level of sound between the President and his visitors. In the Oval Office Building, Morris would look for a miniature microphone inside the telephone, which could be shifted around on the desk for better recording without raising suspicion, and others on the occasional tables and in the wall. Morris believes that the Secret Service would opt for microphones connected directly to the tape recorders by wires passing under the carpets; these require much less maintenance than self-contained battery-operated bugs. Cost: Even the best-quality bugging job would cost no more than a few thousand dollars. Microphones typically sell for $150 apiece, and the most expensive part of the equipment would be the tape recorders; the price can run as high as $4,000 each. Just as intriguing as the nature of the system is the question whether the White House tapes could be undetectably altered. Most experts contacted by NEWSWEEK agreed that they could, although it would require something of an electronic tour de force. "A skilled person can cut and physically splice a tape, and then produce from it another tape that will show no physical indication of a splice," explained Dr. Oscar Tosi of Michigan State University. "But whether the editing remains undetected depends on the skill of both the tampering party and the one trying to detect it. The erasure of a single word would probably be detected immediately. A sentence would be more difficult to detect." As for inserting extra material into the tape during doctoring, Tosi said flatly that the change of background noise would inevitably give the game away to a trained ear or a voice-print machine. If a tamperer merely tries to remove an incriminating phrase from a tape, the problem of background noise is less troublesome. Such noise changes little over short periods of time, and the only possible problem might be, for example, a bell whose ring suddenly is cut off. But the tamperer would have to take great care to cut the tape precisely, with a nonmagnetized blade-to prevent any small electronic blips from appearing on the spliced tape-and to fit the ends with extreme care, to avoid any overlapping. Then he would have to rerecord the tape on another tape, taking care to switch on both recorders at precisely the same moment. And to make sure that the sound quality on all the tapes was uniform, he would have to rerecord every single one of the White House tapes to be released. 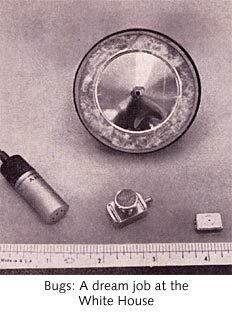 Devices: While more than adequate for their task, the White House bugs were crude compared with the microphones now emerging from the laboratory. One of the most startling is a long-distance device that overhears conversations in a room by monitoring the vibrations that the sound waves cause on window panes. And the CIA is believed to be making extensive use of the "infinity microphone"-a device billed as the world's most effective bug. Hitched to the victim's telephone, it can transmit either phone conversations or voices in the room; it uses telephone current for power, and can't be found with a radio detector. It can be switched on from anywhere in the world, merely by ringing the victim's number, apologizing for a misdial, waiting for the victim to hang up and then sound a signal note. It will keep transmitting until the listener hangs up. Can the average citizen make sure that he's not being bugged? Probably not, say the professionals, unless he is prepared to throw out his telephone, television and other electronic instruments. He should then hold all sensitive conversations in the shower. The sound of water playing on a shower curtain defeats all known bugs-so far.